a. Danish monarchy reached the Faeroes in 1380 with the reign of Olav IV in Norway. b. The Faeroes, Greenland and Iceland were formally Norwegian possessions until 1814 despite 400 years of Danish monarchy beforehand. c. Information for Denmark including the Faroe Islands and Greenland. d. The currency, printed with Faroese motifs, is issued at par with the Danish krone, incorporates the same security features and uses the same sizes and standards as Danish coins and banknotes. Faroese krónur (singular króna) use the Danish ISO 4217 code "DKK". The Faeroe Islands (or Faroe Islands, sometimes simply called Faroes or Faeroes), meaning "Sheep Islands," are a group of islands in Northern Europe, between the Norwegian Sea and the North Atlantic Ocean, roughly equidistant between Iceland, Scotland, and Norway. Controlled variously by Norway and Denmark through the centuries, they have been an autonomous province of the Kingdom of Denmark since 1948, making it a member of the Rigsfællesskab. The Faeroese have, over the years, taken control of most matters except defense (though they have a native coast guard), foreign affairs and the legal system, which are the responsibility of Denmark. The Faroe Islands are an island group consisting of eighteen islands off the coast of Northern Europe, between the Norwegian Sea and the north Atlantic Ocean, about halfway between Iceland and Norway; the closest neighbors being the Northern and Western Isles of Scotland. Its coordinates lie at 62°00′N 06°47′W. Its area is 540 square miles (1,399 square km), with no major lakes or rivers. Having no shared land boundaries with any other country, there are 694 miles of coastline. There are 17 inhabited islands. The island known as Lítla Dímun is uninhabited, as are many islets and reefs. 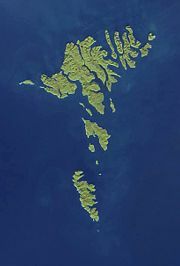 Faroe Islands NASA satellite image. The climate is oceanic and mild, with generally cool summers and mild winters. An overcast sky is common, as are frequent fog and heavy winds. The fog often causes air traffic delays. The islands are rugged and rocky with some low peaks; the coasts are mostly bordered by cliffs. The highest point is Slættaratindur at 2,894 ft. above sea level. The natural vegetation of the Faroe Islands is dominated by Arctic-alpine plants, wild flowers, grasses, moss and lichen. Most of the lowland areas are grassland but some areas are heather, meaning open areas of uncultivated land with low-growing shrubs consistent of small, colorful, urn-shaped flowers; mainly Calluna vulgaris. The islands are characterized by the lack of trees, due to strong westerly winds and frequent gales. 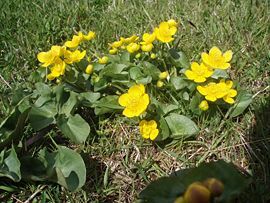 A few small plantations consisting of plants collected from similar climates like Tierra del Fuego in South America and Alaska have been planted and are growing well. Sturdy trees have been planted in some of these sheltered areas. The bird fauna of the Faroe Islands is dominated by sea-birds and birds attracted to open land such as heather, probably due to the lack of woodland and other suitable habitats. Many species have developed special Faroese sub-species such as Eider, Starling, Wren, Guillemot, and Black Guillemot. Only a few species of wild land mammals are found in the Faroe Islands today, all were introduced from other locations. Grey Seals are very common around the Faroese shores, as are several species of whales which live in the surrounding waters. Best known are the Short-finned Pilot Whales, but the more exotic Killer whales sometimes visit the Faroese fjords, a long, narrow, deep inlet of the sea between steep slopes. The early history of the Faroe Islands is not well known. Irish hermit monks settled there in the in approximately 700 C.E., introducing sheep and goats to the islands. 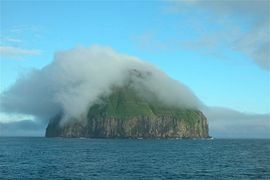 Saint Brendan, who lived circa 484–578, is said to have visited the Faroe Islands on two or three occasions, naming two of the islands Sheep Island and Paradise Island of Birds. The name first appeared as Faereyiar (c. 1225), meaning “Sheep Islands,” which presumably led to the national symbol, a ram. The Vikings replaced the Irish settlers around 700 C.E., bringing the Old Norse language to the islands, which locally evolved into the modern Faroese language spoken today. The settlers are not thought to have come directly from Norway, but rather from the Norwegian settlements in Shetland, Orkney, and around the Irish Sea, and to have been what was called Norse-Gaels. According to oral tradition, emigrants who left Norway to escape the tyranny of Harald I of Norway settled in the islands about the end of the ninth century. Early in the eleventh century, Sigmundur Brestirson, whose family had flourished in the southern islands but had been almost exterminated by invaders from the northern islands, escaped to Norway and was sent back to take possession of the islands for Olaf Tryggvason, king of Norway. He introduced Christianity and, though he was subsequently murdered, Norwegian supremacy was upheld. The Faroes had become a Norwegian province in 1035 and remained under that nation's control of the islands continued until 1380, when Norway entered the Kalmar Union with Denmark. They remained administratively under Norway until 1709, at which time they were attached to the diocese of Zealand. A Danish royal trade monopoly, their own economic develop was limited. When the union between Denmark and Norway was dissolved as a result of the Treaty of Kiel in 1814, Denmark retained possession of the Faroe Islands. The trade monopoly in the Faroe Islands was abolished in 1856. 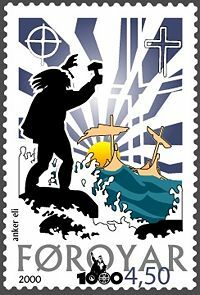 The national awakening since 1888 was first based on a struggle for the Faroese language, and thus more culturally oriented, but after 1906 was more and more politically oriented with the foundation of the political parties of the Faroe Islands. On April 12, 1940, the Faroes were occupied by British troops. The move followed the invasion of Denmark by Nazi Germany and had the objective of strengthening British control of the North Atlantic. In 1942–1943 the British Royal Engineers built the only airport in the Faroes, Vágar Airport. Control of the islands reverted to Denmark following the war, but in 1948 a home-rule regime was implemented granting a high degree of local autonomy. The Faroes declined to join Denmark in entering the European Community (now European Union) in 1973. The islands experienced considerable economic difficulties following the collapse of the fishing industry in the early 1990s, but have since made efforts to diversify the economy. Support for independence has grown and is the objective of the government. The uninhabited island Lítla Dímun. The Faeroe Islands are a self-governing region within the Danish state and send two representatives (elected every four years) to the Danish legislature. The Faeroe Parliament has 32 elected members. The Parliament elects an executive body, headed by a chairman known as the Løgmaður or prime minister in English. The government of the Faroes holds the executive power in local government affairs. Elections are held in the municipalities, on a national level for the Løgting, and inside the Kingdom of Denmark for the Folketing (national level). Denmark stations a commissioner in the Islands. The Folketing oversees foreign policy, defense and the Foreign policy, defense, and the monetary and judicial systems. The Treaty of Kiel in 1814 terminated the Danish-Norwegian union. Norway came under the rule of the King of Sweden, but the Faeroe Islands, Iceland, and Greenland remained as possessions of Denmark. Subsequently, the Løgting was abolished (1816), and the Faeroe Islands were to be governed as a regular county of Denmark, with the Amtmand as its head of government. In 1851 the Løgting was resurrected, but served mainly as an advisory power until 1948. At the end of the Second World War a portion of the population favored independence from Denmark, and on September 14, 1946 a public election was held on the question of secession. It was not considered a referendum, as the parliament was not bound to follow the decision of the vote. This was the first time that the Faeroese people were asked if they favored independence or if they wanted to continue as a part of the Danish kingdom. The outcome of the vote produced a small majority in favor of secession, but the coalition in parliament could not reach a resolution on how this election should be interpreted and implemented; because of these irresolvable differences the coalition fell apart. A parliamentary election was again held just a few months later, in which the political parties that favored staying in the Danish kingdom increased their share of the vote and formed a coalition. Based on this increased share of the votes, they chose to reject secession. Instead, a compromise was made and the Folketing passed a home-rule law, which came into effect in 1948. 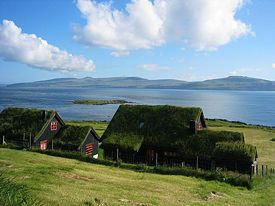 The Faeroe Islands' status as a Danish county was brought to an end with the home-rule law; the Faroe Islands were given a high degree of self-governance, supported by a substantial annual subsidy from Denmark. The islanders are fairly evenly split between those favoring independence and those who prefer to continue as a part of the Kingdom of Denmark. Within both camps there is, however, a wide range of opinions. Of those who favor independence, some are in favor of an immediate unilateral declaration. Others see it as something to be attained gradually and with the full consent of the Danish government and the Danish nation. In the unionist camp there are also many who foresee and welcome a gradual increase in autonomy even as strong ties to Denmark are maintained. Administratively, the islands are divided into 34 municipalities within which 120 or so cities and villages lie. 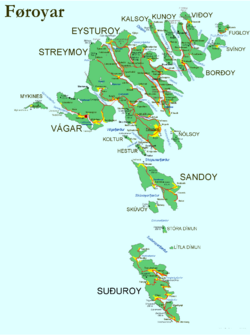 Traditionally, there are also the six sýslur ("regions") Norðoyar, Eysturoy, Streymoy, Vágar, Sandoy and Suðuroy. Although today sýsla technically means "police district," the term is still commonly used to indicate a geographical region. In earlier times, each sýsla had its own ting or assembly. 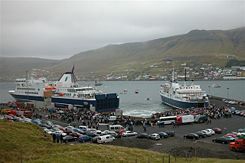 After severe economic troubles in the early 1990s, brought on by a drop in the vital fish catch and poor economic management, the Faroe Islands began to rebound in the latter half of the 1990s. Unemployment was down to 5 percent in mid-1998. By 2006 that had sunk to 3 percent, one of the lowest rates in Europe. Nevertheless, the almost total dependence on fishing means that the economy remains extremely vulnerable. The Faroese hope to broaden their economic base by building new fish-processing plants. 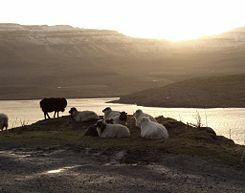 As an agrarian society, other than fishing, the raising of sheep is the main industry of the islands. Petroleum found close to the Faeroese area gives hope for deposits in the immediate area, which may provide a basis for sustained economic prosperity. Coal is mined on Sudhur Island. Since 2000, new information technology and business projects have been fostered in the Faeroe Islands to attract new investment. The introduction of Burger King in Tórshavn was widely publicized and a sign of the globalization of Faeroese culture. Fuels, basic manufactures, and transport equipment are the Islands' major imports. Eighty percent of the population of the Islands is connected by under-ocean tunnels, bridges, and causeways which connect the three largest islands and three other large islands to the northeast, while the other two large islands to the south of the main area are connected to the main area with ferries. There are good roads that lead to every village in the islands, except for seven of the smaller islands which have only one village each. Vágar Airport has scheduled service to destinations from Vágoy Island. The largest airline serving the Faeroese airline is Atlantic Airways. 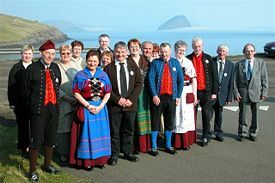 Of the approximately 48,000 inhabitants of the Faroe Islands, 98 percent were realm citizens (2004 census), meaning Faroese, Danish, or Greenlandic. The largest group of foreigners is Icelanders comprising 0.4 percent of the population, followed by Norwegians and Polish, each comprising 0.2 percent. The Faeroese language is one of the smallest of the Germanic languages. Faeroese grammar is most similar to Icelandic and Old Norse. In contrast, spoken Faeroese differs much from Icelandic and is closer to Norwegian dialects from the west coast of Norway. Most Faeroese also speak English. In the twentieth century, Faeroese became the official language. Since the Faeroes are a part of the Danish realm, Danish is taught in schools as a compulsory second language. Faroese language policy provides for the active creation of new terms in Faeroese suitable for modern life. 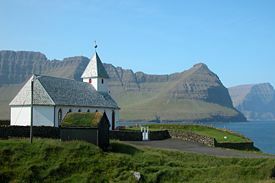 According to official statistics from 2002, 84.1 percent of the Faeroese population are members of the state church, the Faroese People's Church, a form of Lutheranism. Faeroese members of the clergy who have had historical importance include V. U. Hammershaimb (1819-1909), Frederik Petersen (1853-1917) and, perhaps most significantly, Jákup Dahl (1878-1944), who had a great influence in ensuring that the Faroese language was spoken in the church instead of Danish. In the late 1820s, the Christian Evangelical religious movement, the Plymouth Brethren, was established in England. In 1865, a member of this movement, William Gibson Sloan, travelled to the Faeroes from Shetland. By the turn of the century, the Faeroese Plymouth Brethren numbered thirty. Today, approximately 10 percent of the population are members of the Open Brethren community. About 5 percent belong to other Christian churches, such as the Adventists, who operate a private school in Tórshavn. Jehovah's Witnesses also number four congregations (approximately 80 to 100 members). The Roman Catholic congregation comprises approximately 170 members. The municipality of Tórshavn operates a Franciscan school. There is a small number of member of the Bahá'í faith. The best known church buildings in the Faroe Islands include Saint Olafs Church and the unfinished Magnus Cathedral in Kirkjubøur; the Vesturkirkjan and the Maria Church, both of which are situated in Tórshavn; the church of Fámjin; the octagonal church in Haldarsvík; Christianskirkjan in Klaksvík and also the two pictured here. In 1948, Victor Danielsen (Plymouth Brethren) completed the first Bible translation into the Faeroese language from various modern languages. Jacob Dahl and Kristian Osvald Viderø (Fólkakirkjan) completed the second translation in 1961. The latter was translated from the original languages into Faeroese. Faeroe Islands village homes, note the grass on the roofs. The Faeroes have been a part of Denmark since the fourteenth century, however, they have their own unique culture which has been protected in part by their isolation in the North Atlantic. They claim proudly, "We are not Danish, we are Faeroese." They have their own language, their own sagas, their own dances, music and customs. In the remote villages and countryside one can still see homes with grass roofs, first created by the Vikings who arrived in the 8th century. Upon their arrival, they made rock foundations in the shapes of their boats, turned the boats over on top of the rocks and then, to stabilize and insulate them, put sod on the hulls of the boats. These became their homes, and it is not uncommon to come upon a Faeroese mowing his roof even today. Killed pilot whales on the beach in the village Hvalba on the southernmost Faeroese island Suðuroy, August 2002. Whaling in the Islands is regulated by Faeroese authorities and approved by the International Whaling Commission. Approximately 950 Long-finned Pilot Whales are killed annually, mainly during the summer. Occasionally, other species are hunted as well, such as the Northern Bottlenose Whale and Atlantic White-sided Dolphin. The hunts, called "grindadráp" in the Faeroese language, are non-commercial and are organized on a community level; anyone can participate. During the hunt, the whale is surrounded by the hunters with a wide semi-circle of boats. The boats then drive the whales slowly into a bay or to the bottom of a fjord. Once beached the whale is killed - within seconds so that the mammal's suffering is extremely short-lived. The catch is divided among those taking part in the drive and the local residents of the whaling bays and districts in accordance with a complex, traditional community sharing system. The whale hunt is considered an important part of their culture and history of the Islanders. However, animal rights groups criticize the hunt as being "cruel, unnecessary and unsustainable." Whalers respond that sufficient knowledge of the catch methods or its economic or cultural significance is not understood. Faeroese folk dancers in national costumes. Faeroese music is primarily vocal, accompanied by the fiddle (which arrived in the 17th century) and European dances such as the minuet and polka. During the twentieth century choirs have played an important role in the musical arena of the Faeroes. The islands have their own symphony orchestra, the classical ensemble Aldubáran and many different choirs; the most well-known being Havnarkórið. The most well-known Faroese composers are Sunleif Rasmussen and the Dane Kristian Blak. The first Faeroese opera ever is entitled Í Óðamansgarði (The Madman´s Garden), by Sunleif Rasmussen which opened on the October 12, 2006, at the Nordic House. The opera is based on a short story by the writer William Heinesen. Young Faeroese musicians who have gained much popularity recently are Eivør (Eivør Pálsdóttir), Lena (Lena Andersen), Teitur (Teitur Lassen), Høgni Lisberg and Brandur Enni. Well-known bands include Týr, Goodiepal, Gestir, Marius, 200 and the former band Clickhaze. The festival for contemporary and classical music, Summartónar, is held each summer. Large open-air music festivals for popular music with both local and international musicians participating are G! Festival in Gøta in July and Summarfestivalurin in Klaksvík in August. Traditional Faroese food: Dried mutton and whale meat and blubber. Traditional Faeroese food is mainly based on meat and potatoes and uses few fresh vegetables. Mutton is the basis of many meals, and one of the most popular treats is skerpikjøt, well aged, wind-dried mutton which is quite chewy. The drying shed, known as a hjallur, is a standard feature in many Faroese homes, particularly in the small towns and villages. 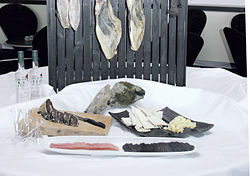 Other traditional foods are ræst kjøt (semi-dried mutton) and ræstur fiskur, matured fish. Fresh fish also features strongly in the traditional local diet, as do seabirds, such as Faeroese puffins, and their eggs. Another important specialty is Grind og spik, pilot whale meat and blubber, which has for centuries has been an important staple. 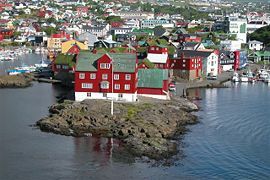 ↑ Statistical Facts about the Faroe Islands, Løgmansskrivstovan, Statistical Facts The Prime Minister's Office. Retrieved January 23, 2012. ↑ Central Intelligence Agency, Faroe Islands The World Factbook. Retrieved January 23, 2012. ↑ Aurora Boreal. The Faroese Fauna Retrieved October 25, 2007. ↑ European Society of Human Genetics. January 25, 2006. Highly discrepant proportions of female and male Scandinavian and British Isles ancestry within the isolated population of the Faroe Islands Retrieved October 27, 2007. ↑ Stephen Metcalf, March 25, 2007. Into the Mystical Unreal Reality of the Faroe Islands New York Times. Retrieved October 28, 2007. ↑ Whale and Dolphin Conservation Society. An Introduction to the History of Whaling Retrieved October 28, 2007. ↑ Department of Foreign Affairs. Whales and whaling in the Faroe Islands Retrieved October 28, 2007. ↑ Whale and Dolphin Conservation Society. Stop Bloody Whaling Retrieved October 28, 2007. Irvine, David E. G., Ian Tittley, W. F. Farnham, Peter W. G. Gray, and James H. Price. 1982. Seaweeds of the Faroes 1: The flora. London: British Museum of Natural History, 109 - 131. Irvine, David E. G., Ian Tittley, W. F. Farnham, Peter W. G. Gray, and James H. Price. 1982. Seaweeds of the Faroes 2: Sheltered fjords and sounds. Bull. British Museum of Natural History, 133 - 151. Norden. Offical Site of the Nordic House of the Faroe Islands. Faroe Nature. Faroes Informative Nature Website. This page was last modified on 25 March 2017, at 15:43.